What Scares You? 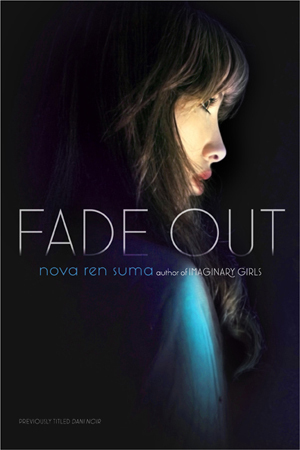 BOOK GIVEAWAY! Happy Halloween, and thank you for reading all the “What Scares You?” guest blogs these past two weeks! Now it’s time for the big giveaway—made up of books and ARCs donated by my publisher Penguin Teen and by some of the guest authors. I’m giving away FOUR PRIZE PACKS. 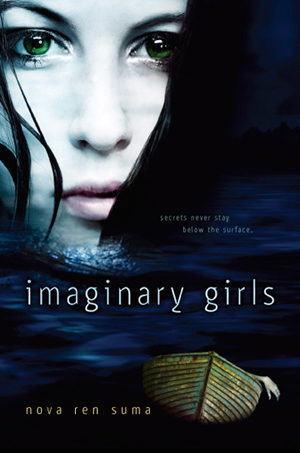 Prize Pack #4—donated by guest authors: Imaginary Girls by me! (signed! ), The Haunting of Hill House by Shirley Jackson, Julet Immortal by Stacey Jay (signed! ), Petty Magic by Camille DeAngelis (signed! 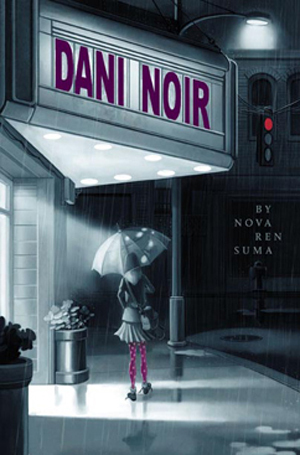 ), The Revenant by Sonia Gensler, Misfit by Jon Skovron (signed! ), and Frost by Marianna Baer (signed!). You must use the form to enter. Comments on this post won’t count as giveaway entries. You must have a US address where we can send your prize pack. Due to shipping costs, I’m sorry to say that this giveaway is not international. You can gain extra entries in the giveaway by commenting on the guest blogs. Every guest blog you’ve commented on will give you an extra chance to win. I will close this giveaway to entries on Monday, November 7 at 5pm EST. The FOUR WINNERS will be chosen by random draw (or by some newfangled randomizing code-script thingie I will force E to make for me). My thanks go to all the wonderful guest bloggers who contributed to this “What Scares You?” blog series, to Penguin Teen for donating prizes for the giveaway, to Robert Roxby for generously designing and illustrating the “What Scares You?” images, and to everyone who read these posts, tweeted about them, and commented. I will probably never again give away this many books in my lifetime, so go enter! What’s next for this blog? INSPIRATION in time for NaNoWriMo, including new guest blogs by inspiring authors I know! Check back here tomorrow and you’ll see what I mean! There are few things I love more than a good scare. Wait, before you sneak up behind me and grab my neck, let me clarify: I don’t mean scared in the sense of, “Wait, did I forget to file my taxes?” or “What’s that spot on my leg?” I mean a proper scare courtesy of masterful horror—the sort of gray, October sky, leaves-skittering-across-a-sidewalk, impending doom feeling that has you pushing up your collar and hurrying your steps for no reason you can really name and wait, was that someone standing at the upstairs window in that old house on the corner, the one no one’s lived in for thirty years…not since…the murder? Horror has always been my genre of choice. The creepy, the spooky, the phantasmagorical—all catnip to me. Summers when I visited my superstitious, Pennsylvania Dutch great-grandmother, she would regale me with ghost stories about my great-great-great-grandmother, an undertaker’s wife and psychic who could, allegedly, see and speak to the dead. Then she’d send me to sleep in the attic. This is why I have issues. I watched Dark Shadows every afternoon and Hammer Horror films whenever I could, thrilling to the gothic, Pinewood Studios sets and anachronistic beehive hairdos. Dario Argento’s Suspiria gave me gorgeous Technicolor nightmares and a healthy fear of stained-glass ceilings. I read horror comics that I hid under my bed and, when I was older, I gobbled up stories by Edgar Allan Poe, Nathaniel Hawthorne, Henry James, Shirley Jackson, Richard Matheson, and Stephen King. Salem’s Lot is the book I have reread above all others. But the thing that always made me look over my shoulder, more than the prospect of vampires, clowns, zombies, strangers in scarecrow hoods, or Olan Mills family photography, is anything having to do with the occult. Satan in particular. Beelzebub, baby. You know, He Who Pwns All. Maybe it’s because I grew up in the church (I’m a PK), or the fact that the mid-1970s of my childhood were rife with Satanic movies, books, cults, and fears, but anything remotely demonic scared the…well, BeJesus out of me. And yet, I craved those stories. I mean, dude! Let other people go head-to-head with Jason, Freddie, and Michael Myers. Battling The Big D? Go big or go home. That’s my motto. The Exorcist, Rosemary’s Baby, The Sentinel, Satan’s School for Girls—this is my terror turf, the sort of thing that makes me want to put on my Bruce Campbell outfit, fire up the chainsaw, and say, “Groovy.” When I was twelve, I went to see The Omen with a friend, and she and I stayed up half the night hiding in her closet, surrounded by anything that looked vaguely religious—a Bible, Popsicle sticks which could be made into a cross in a snap (It is a well-known fact that the Dark Lord does not like frozen ice treats), “holy” water in a Snoopy glass that we had blessed ourselves. A collection of scarves. (Even at twelve, I understood the importance of accessorizing.) We were terrified. We were also thrilled. It never dawned on us that Old Scratch probably had better places to visit than a closet in Denton, Texas. I mean, the Dallas Cowboys Cheerleaders were just thirty miles away. Our twelve-year-old logic was this: You can outrun, outwit, or out-wait some crazy psychopath in a hockey mask. But Lucifer’s got game. The Dude’s not going anywhere until your soul is his or you’ve made a grand gesture of offing yourself in the name of can’t-be-turned holiness—or you’ve figured out his weak spot. The stakes are high. Too high for a horror gambler to leave the table. And along the way, Satan will possess your cat, make the walls bleed, kill people in hideously mysterious ways, play Carmina Burana out of nowhere when you are walking in the woods even when you say, “Quit it, Satan! That’s, like, super creepy!”, order ominous nannies to your house, record Led Zeppelin albums, do the freaky backwards voices on conveniently running tape recorders that when played will make you soil yourself, send his demons to eat the last Little Debbie snack cake, and just generally mess with you in ways that have you and everyone else doubting your sanity. And he’ll probably look good doing it, too. I mean, Robert DeNiro in Angel Heart? Hot. ME: Dude, this is not a fair fight. SATAN: Ah. So I am. (Dabs lips with a damask napkin) You could always forfeit and give me your soul. ME: Yeah, gotta say, that seems to lack dramatic tension. SATAN: Agreed. Could you pass the steak sauce? ME: (Passing sauce. Note that Satan needs a manicure.) Besides, if I give in to you, my head will swivel on my neck, I’ll have the eyes of a rabid dog, and my sinuses will produce vomity-hair gel snot. SATAN: Not always. Rupert Murdoch looks good. Very nice suits. Here, try the beef. It’s outstanding. ME: I’m not falling for that. SATAN: Falling for what? It’s just steak. And it’s perfectly seasoned. (shrugs) Suit yourself. Look, there’s always a chance you’ll defeat me. SATAN: (laughs) No. False hope. I manufactured that. See: Boston Red Sox, 1918–2004. (pats cheek) Face it—you will be a vessel for evil. Which is much better than being a vessel for, say, olive oil. Celebrate the little things. That’s what we say in hell. We say it between screams, but you know. It’s the thought. When I was younger, I thought that movies about demonic possession were terrifying object lessons in “You better not pout, you better not cry, you better not shout or SATAN CLAUS WILL DRAG YOU TO HELL!” (Please also see: Fear of Christmas.) But as I got older, I began to see these movies as representations of our fears about a loss of identity and individualism. I mean, you can be POSSESSED! Through no fault of your own! “Honest, Father O’Brien, I was just sitting here playing with this here Ouija Board while listening to Black Sabbath and burning my flesh with the hot wax of midnight mass candles and the Devil done invaded my soul without even an Evite from me. Gettin’ to be that a body don’t even feel safe drinking from her I Heart Goats mug, anymore.” It’s the fear that your humanity can be stripped from you bit by horrible-convulsions-on-the-bed-head-turning-completely-around-doing-icky-things-with-a-crucifix bit by some amorphous, invisible, malevolent force with whom there is no reasoning. You know, kind of like the current political climate. So when October rolls around and the sky darkens, when the wind howls like the last cry of a doomed man and children in Halloween costumes run past laughing those little-kid laughs that sometimes make you wonder if said children were made in a test tube by an escaped Nazi bent on overthrowing the world order, you’ll find me nestled on my couch watching Rosemary’s Baby, and hoping against hope that she’ll win the ultimate fight. But I’ll have my Popsicle sticks with me. Because, you know, I’m not taking any chances. Libba Bray is hard at work on The Diviners, the first book in a four-book series that is full of the creepy. She’s listening to “Tubular Bells” while she writes. Visit Libba’s blog at libba-bray.livejournal.com. Comment on this guest blog and you’ll gain an extra entry for the big Halloween giveaway that opens TODAY, October 31, containing prize packs of signed books plus books and ARCs donated by my publisher Penguin Teen! The book that terrified me when I was twelve years old isn’t a ghost story. It’s not a horror novel, either (though I did read all of my stepfather’s Stephen King novels—I basically read anything in the house that had words on it, including all my mom’s Atwood, Walker, Piercy, Jong, Zimmer Bradley, and Auel novels as well as cereal boxes and shampoo bottles). No, the book that scared me back then isn’t fiction at all, and I think that’s why the lasting terror. Because this book was TRUE. A doctor said so. It certainly wasn’t published to haunt an unwitting twelve-year-old girl. The book had a rust-red hardcover spine. The book jacket was long-lost, so all I remember is catching sight of the naked spine on my parents’ bookshelves in the living room. I was curious. And I was lonely and bored. We’d moved into a new house, in a new state, and I’d just started the seventh grade in a new school. I had an unflattering layered haircut, fingerless lace gloves, a weird name, a shy streak that kept me from speaking up in front of people, and a secret interest in dark and twisted things. The house we were renting was down a dead-end dirt road, up a steep dirt driveway, and set at the top of a hill, overlooking a great expanse of nothing full of trees. The internet did not yet exist, but even so… We did not have TV reception. We had no visible neighbors. There was nothing but the house itself, wood-colored so it blended in with the trees. We were renting this house from former revolutionaries (a whole other story I’ll write about one day), and it often unearthed some interesting finds. Pieces of buried political history. A jar of unwanted pennies under the sink. Easter-colored dishes with chips on the sides as if rescued from a food fight. So I don’t know if I thought this book belonged to the mysterious people who owned the house or if it was ours, and had been all along. All I know is I’d never seen the book before we moved in. I carried the book to my room and began reading. Sybil wasn’t a novel, I read, it was a psychological case study. A woman—in the book she’s known as Sybil Dorsett, to protect her privacy—has a whole host of people living inside her, many of them still children. They have names and separate personalities. They look different. They are different. She’s one body for sixteen different people. I didn’t know this could be possible… Multiple Personality Disorder, as it was called then. I didn’t know you could carry this possibility inside you and then, when you got older than twelve… say, when you turned into a teenager (as this illness was often first shown to emerge in teenagers) it could split you apart into different people. The book had drawings. Drawings Sybil made as her other personalities. Each in their own distinctive style, as if actually drawn by different hands. I remember them: Vicky and the Peggys and more. I remember wondering about the personalities… were they always listening? Where did they hide inside Sybil’s head… and in my head, who was hiding in there? How many of there were me? Sybil was the first book that ever truly scared me to my core, but there’s another book I read far more recently that got under my skin. And that was its intention. It’s a book about a house. I guess you should know that I’m wary of houses, especially old ones with layers of history. Especially ones in the middle of nowhere, surrounded on all sides by trees. I can admit that because I don’t live in one—I live in a blessed apartment without any stairs to run up in terror while a cold finger claws at my back. In the apartment building where I live, at every hour of every day, I can hear other human occupants on the other side of the walls, or above or below me, or out in the courtyard playing beer pong (I hate them! But they don’t scare me), and I feel safe. Living in cramped and crowded Manhattan makes me feel safer than I ever felt living in that house off the dirt road that we moved into when I was twelve. We’ve since considered that the house could have been haunted, as there were some questionable events involving a Ouija board that I’m not sure how to explain away, and a frightening part of the basement no one would enter, but I believed many things to be haunted back then… I was easily susceptible. I still am. So of course I’m drawn to haunted-house stories. And here is the mother of them all. Anyone else read The Haunting of Hill House by Shirley Jackson? The house in question is a haunted mansion where a paranormal investigator goes to live with two guests who’ve agreed to stay there with him to see if they can witness any strange occurrences. One of those guests is Eleanor, who begins to witness some frightening sights inside that house—and I don’t know if we can believe what Eleanor tells us she sees. We’re meant to wonder. To question what’s real and what’s not, all of which plays into our fears. Well, certainly my fears. I vividly remember reading this book in my living room. I was alone. The lights were all out except for a single lamp above my head. I came to a scene, a spine-tingling section involving a series of phantom knocks coming from out in the hallways, pounding pounding on a bedroom door, and when the lights in my living room dimmed for a moment as they sometimes do (nothing supernatural; our building often has brownouts), I shrieked loudly, and forgot that I was only reading a book. That it wasn’t real. What gave me such chills is the unseen. When, in some stories and movies, the big scary monster is revealed in all its glory, it loses its power for me. Not so with The Haunting of Hill House. The not-knowing, the never-being-sure, the imagination let loose and running down the hallway pounding menacingly on doors… that, for me, is true fear. Sometime later I was brought back to that heart-pounding moment in the book again. I’d found myself in a single-room cabin in the woods (this during my latest visit to the MacDowell Colony, far away from home in rural New Hampshire where the dark nights were so full of… nothing else to call it but complete darkness… that after dinner when I went back to my studio alone I’d chatter to myself inanely as I walked the paths at night with my skittering flashlight—“just make it to the door you can do it no one’s out there just make it to the door look there’s the door you’re fine you’re fine you’re fine get your key out there’s your key you’re almost there” etc.) and I was reminded again of this book. I was writing at my desk, at night, with my back to the door that led to the screened-in porch. I never went out out there because it was winter, and snow had swept in through the screens, piling up and making it impossible to use as a second entrance. So there I was, writing, alone, in the quiet, at night. Then in the deep silence surrounding my tiny little house in the woods, I heard three sharp knocks. From the door behind me, the one connected to the screened-in porch. I remember turning very slowly to face the door. I’d heard nothing, I told myself. I’d made it up. Uh, no. Because it knocked again. Immediately where did my mind go? To The Haunting of Hill House, of course. Something had knocked on the door in that book… and something was knocking on the door in my studio in the woods right then. Did I open the door? Did I open the door to discover it was only the wind coming through the screened-in porch, and it had thrown a stick from the woodpile against the door, so it sounded like something knocking? But before I opened that door, I don’t even want to admit here all of what I was thinking. You see, my imagination gets away from me. Ask me (or my poor other half) sometime about the ceiling nightmares that plagued me for years when we had the loft bed. There is that moment—spine-tingling, fear rising—when I’m convinced beyond rights or reason that it is REAL. Books bring it all to life. And who am I to explain it away and open the door? I want to thank everyone for being involved in this What Scares You? blog series—the authors who wrote guest blogs for me, the authors who donated their own books to give away, Penguin Teen for generously donating so many books for the giveaway, Robert Roxby for the amazing design and illustrations, and YOU, for reading. 1) A guest post by the scarily brilliant Libba Bray—on horror! 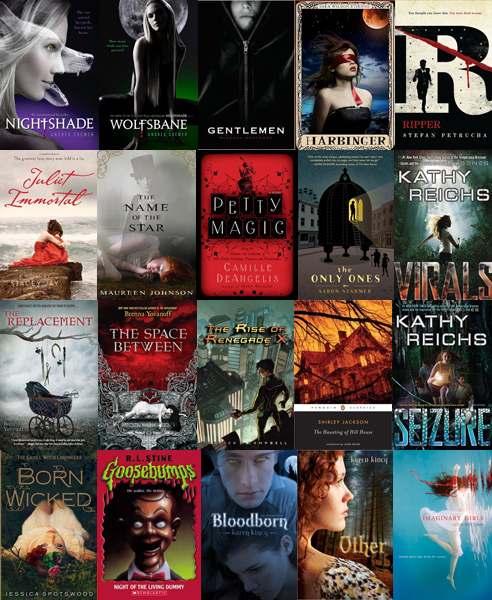 2) A big book giveaway—I’m giving away more than 20 books! If you want to get a jump on the Halloween giveaway, this is just a reminder that every guest blog you comment on will give you an extra entry. I’ll randomly choose the winners of the prize packs, so you could win a stash of creepy books if you never comment or you could win a stash of creepy books if you comment thirty times, who knows, it’s random and I might ask a ghost to pick the winners. You can read all the “What Scares You?” guest blogs with this tag. I love, love, love to be scared. Mind you, I should clarify that by saying that I am a giant fraidy-cat; I get spooked out easily and the slightest sense of discomfit will keep me up at night. 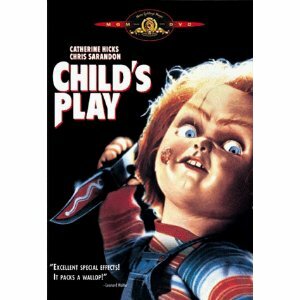 But somehow, that doesn’t stop me from indulging in thrills and chills. I maintain that this love of the dark side is inherited from my mother, who, when I was little and she was in graduate school, used to work on her Master’s coursework with B-horror movies on mute in the background. It was not uncommon for five-year-old Micol to walk into our den to see “classics” like The Red-Eyed Monster playing out on the small screen in the background. Needless to say, it made an impression. These days, mother-daughter horror movie marathons are our standard form of bonding session, and we have both worried, only semi-jokingly, about what we will do if and when my impending daughter (due this December, sadly too late for Halloween ’11) chooses to eschew our beloved pastime for girlier pastures. Of course, I’ve always been an avid reader, as well, and my mother also passed along a great love of the master, Stephen King. I stole away to the darkest corners of the library to read The Shining in secret at age eleven. When I was twelve, my father, realizing that he was quickly getting left out of the loop, came home with a gift for me. Helter Skelter, the true story of the Manson Family murders. Oh, yes. And so it was. Did I mention the book had a photo insert? A photo. Insert. I tore through the first third of the book immediately. Not even after moving to a sleeping bag on my baby brother’s bedroom floor. And when I woke up in the morning, my father had left a note under my pillow—Helter Skelter, just like what the Family had scrawled on the walls of the Tate-LaBianca murders. So, you get why I am the way I am, right? Many years—and countless therapy sessions—later, I’ve managed to make this obsession with the macabre work for me. I’ve even somehow parlayed it into a career of sorts. If that’s not a happy ending, I don’t know what is. Or other dolls-come-to-life. They gave Buffy “the wig,” and so goes my nation. Particularly when possessed or otherwise dangerous. See also: boiler rooms, etc. People, stay above ground. If someone offers you cash to spend the night in one of these places? Seriously, people—don’t even. A little tip from me to you. Micol Ostow is half Puerto Rican, half Jewish, half reader, half writer, and, when under deadline, often half asleep. Micol was working as an editor of young adult fiction when she began to write her own books; since then, she has published over 40 works for readers of all ages. Her novel, Emily Goldberg Learns to Salsa , was named a New York Public Library Book for the Teen Age, and her graphic novel hybrid, So Punk Rock: And Other Ways to Disappoint Your Mother , was chosen as a Sydney Taylor Notable Book for Teens. Micol received her MFA in Writing For Children and Young Adults from Vermont College of Fine Arts in 2009, and currently teaches a popular young adult writing workshop through Media Bistro. She lives in NYC with her Emmy-award winning filmmaker husband, Noah Harlan, and a persnickety French Bulldog named Bridget Jones. In the 1980s, I was obsessed with a television show called Amazing Stories. Each episode was a self-contained tale about some bizarre, impossible event. You never knew what kind of story it would be though, because they ran the gamut from silly to heartwarming to macabre. There was one episode in particular about a horror novelist that I still consider one of the scariest things I’ve ever seen. I can’t quite remember why it happens to him. Something to do with him being arrogant and mean to everyone he knows (yanno, as us novelists generally are). Anyway, for whatever reason, one day while he’s looking at himself in the mirror, he sees a hideously deformed man sneaking up behind him. But when he turns around, there’s no one there. This experience repeats whenever he sees himself in any reflective surface. And each time, the deformed man is a little closer. After a few times, you can tell the man has a wire stretched between his hands and he means to strangle the novelist with it. Well, of course the poor novelist is freaking out, trying desperately to make amends with everyone he knows. But it doesn’t work. The man gets closer and closer. Finally, the novelist covers all the reflective surfaces in his house and refuses to go outside ever again. But then his girlfriend comes over. They’re sitting on the couch, gazing adoringly at each other and the novelist sees his reflection in his girlfriend’s beautiful blue eyes. The man is in that reflection of course, and this time there is no escape. He strangles the novelist. But the novelist doesn’t actually die. Instead he becomes the deformed man. The girlfriend screams in horror and loathing, he throws himself through the front window and runs out into the street, where he’s hit by a car and dies. Rarely do you get to see such a blatant visual depiction of a person consumed by their own darkness. And that’s what scares me more than anything else. Whether it’s the slow descent into madness in the stories of Edgar Allan Poe or the temptation of Anakin Skywalker to the dark side of the Force, there is nothing that haunts me more than our own human capacity for evil. I remember sitting in the movie theater as a very small boy watching Empire Strikes Back. When Vader tried to tempt Luke over to the dark side, I cried out “Luke! Doooon’t doooo it!” and sobbed hysterically into my stoic father’s shoulder. I do get some chills from the forced conversion, when someone gets possessed or gets infected with a zombie plague or whatever. But the real horror for me is when someone makes the conscious choice to let the darkness in. You might think, then, that I would avoid evil, darkness, and anything to do with it. All smiles and dashing heroics for me! But nope. I never dressed up as Luke Skywalker for Halloween, but I dressed up as Darth Vader twice. My favorite thing about G.I. Joe was the bizarre menagerie of villains they battled against, and I longed for Skeletor or Megatron to win, just once. The only “good guy” I actually liked was Batman. And really, his “goodness” has always been a bit in question. And I still rooted for the Joker. This fondness for the dark side has carried with me into adulthood. The difference is, now I write my own villains. But the fear remains. And it is very strange to fear the product of your own imagination. I hope you’ll forgive the allusion to my own work, but I often wonder, by writing about the darkness, am I exorcising my demons or encouraging them? How long can I dance along the edge of the abyss before I fall in? But like all of us, I’m not just one type of person, all brooding and angst. In fact, in real life I’m probably closer to Han Solo than Darth Vader. Because even as I’m pondering the abyss, I’m smirking at it, turning it into a joke, mocking it like anything that takes itself too seriously deserves to be mocked. And at other times, I am ethereal, in love with life, my head so far in the clouds it’s as though I’ve forgotten the abyss even exists. And perhaps in the end, my humor and my hope will keep me safe. In the meantime, I continue to write along the edge of my own fear, which, for better or worse, is my favorite place to be. Jon Skovron is the author of Misfit, a YA novel about a half-demon girl in Catholic school, as well as the indie rock novel Struts & Frets. He lives with his two sons outside Washington DC. His sons, ages 6 and 8, chose to dress up as Darth Vader and Darth Maul this year for Halloween. He would like it known that this was entirely their own idea and not something he pressured them into. When I was a kid, if you asked me to write a story about the scariest thing ever, I would have probably written something about the most foul, undead, oozing, crawling monster ever. With glowing red eyes. Unspeakable evil that eats kittens for breakfast and unicorns for lunch. But that’s not what really scares me. Now I would write about the pause where possible disasters flash through your mind like a murder of crows. You stand, paralyzed, and realize you don’t know what will happen to you. Now I would write about the shadows on the wall, those shapes you don’t recognize, and the whispers in your mind, talking to parts of yourself you don’t recognize, either. It’s the whitespace in a story that really scares me. The gaps between the words, filled in by a black seeping ooze from the corners of my nightmares. The author doesn’t even need to do that much work; I have an overactive imagination. Fear of the unknown is my fear. But like all readers who relish a good horror story, I masochistically adore the creeped-out feeling of goosebumps prickling your skin, an icy trickle down your spine, and a sudden urge to yelp and leap off the floor, away from the windows and doors. One book that thoroughly, deliciously creeped me out was The Forest of Hands and Teeth by Carrie Ryan. To quote from my original review: “I managed to read 300+ pages straight of this book before someone knocked on my door and I jumped out of bed, adrenaline rushing at the thought of a zombie outside my apartment.” A scene in this book Creeped. Me. Out. In an abandoned house, with zombies shuffling around outside, there’s an abandoned crib. Well, it looks abandoned, at first, but something squirms inside… is it a baby? Alive? So the main character goes and picks it up while I’m screaming at her to put it down, because of course the baby is dead. Undead, rather. So sad, and so, so scary. On the subject of zombies, Rot & Ruin by Jonathan Maberry is an awesome action adventure middle-grade. And of course, like all good zombie books, it has scary parts. I don’t want to be too spoilery, but there are scenes involving characters who might be alive, or might be undead, and it’s really hard to tell, so you’re biting your nails while the definitely-alive characters keep their hands on their weapons. Besides all the scariness, Rot & Ruin tackles the emotional aftermath of loved ones becoming zombies, and makes you feel for the undead. 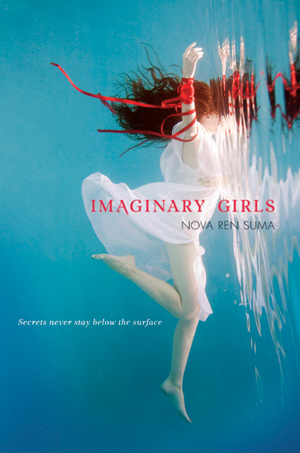 As a nod to our host, Nova, I have to say that Imaginary Girls scared me. I like to read in bed, often at night, and so I merrily started this book. Pretty soon I started getting goosebumps. The dread in this book dawned on me slowly, subtly, like the delicate evocation of horror often found in Japanese films like The Ring—the original one is much creepier than the remake. I didn’t know quite what I should be afraid of, and so the dread built, and built, with all my questions about who was actually dead, and what was actually real. Karen Kincy (Redmond, Washington) lives among countless trees, some of which—her pet kumquats and oranges—have lovingly invaded her apartment. Unlike her characters, she has never been on the run from the law or bitten by a werewolf, though she has been known to howl at the moon. Karen has a BA in Linguistics and Literature from The Evergreen State College, and is studying toward a Master’s in Computational Linguistics.